When Mary Ostyn of Owlhaven asked if I'd review her new book, I reminded her that Like Merchant Ships is a no-PR blog. I'm thrilled to make her the exception. Her new book, A Sane Woman's Guide to Raising a Large Family, did not disappoint. Its 192 pages are packed with practical encouragement--not fluff that makes you feel good now and leaves you hungry later. Not surprisingly, Ostyn's take on frugality is a balanced look at what having a family does--and doesn't have to--cost. "Kids grow fine sharing rooms, and God does fine at stretching budgets. In fact, I suspect he takes delight in surprising us with just how well he can provide." What I loved: this frugal perspective doesn't stop at the money chapter. Ostyn's inventive parent hacks cost little, but save a lot of energy. What I learned: even a toddler can peel vegetables. I haven't been letting my kids work hard enough, and it's hampering their growth as individuals and as a team. 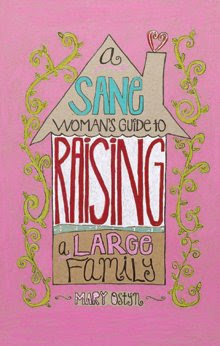 I have a FREE copy of A Sane Woman's Guide to Raising a Large Family to give away! To enter, leave a comment by Friday at midnight. If you have time, why don't you tell us one way that having a family has helped you save money? Although, my husband and I are empty nesters now, I thrive on different ways to stretch our incomes and save money toward retirement. Meredith, you are such an inspiration and I anxiously await each new post! God Bless You and your precious family. Very cool giveaway. Thanks for the chance. Seriously, a toddler can peel vegetables?! I've got a lot of training to do. I have a family of 4, but I bet that some of the advice is applicable to all families. Thanks for making the exception for this resource. And thanks for your beautiful pictures and inspiration everyday. A toddler can peel veggies, but in our case we ended up with peeled fingers! I'm curious, does she explain a certain method? When we were dinks we spent $800/month on groceries and eating out. I spend less than that now with 6 kids! We save because we have to. This is defnintely a book for us. 5 kids under the age of 10 with the last 2 being twins..I keep trying to be more frugal and save time and money. Sounds like a great book. Enter me in the drawing. Having children has pushed me to be more balanced ... disciplined because if they don't see it in me, where are they going to learn it? ... and less of a perfectionist because, well, you get the point. This book sounds great! I think we save money a lot of money by doing true family entertainment: books, parks, games, etc. instead of going out. Would love to win this book! Thanks for the giveaway! She points out that a 2 year old can handle a carrot and a peeler. Even if the vegetables don't get peeled well, the child has been happily occupied AND then you've created the work ethic that will enable the 3-year-old to polish the table, etc. I don't have a large family yet. But can always use more information. One of the ways (only one, mind you!) that a family saves us money is because we entertain each other - board games, pretending, toys, etc. We make each other laugh and enjoy the moment. Although we only have two kids so far, we would love to have a larger family. This book sounds like just the thing I need to help keep me sane! Thanks so much! At this point, I can hardly REMEMBER life before children, lol. Having children has always made us strive to save money/live on one income. Being the mom of 13 now, I am always trying to find new ways to save money. One of our newer ways is to not rent/pay for movie rentals. For about a year now we have been getting all our movies from the Library for free. And, just this week we got a free one night rental with Redbox. Cool! Thanks for a great blog too, Meridith! Oh I NEED this book! Thanks for the give-away. Oh, this looks like fun. I agree that having a big(ish) family (6 kids 7 and under) has forced us to prioritize. Now I find watching my children dance to a noisy toy just as entertaining as any movie, and we feast every night on the lively conversations that erupt at the dinner table. We have a dinner party every night! I would love to have this book -- it sounds like it would be so encouraging! I have four children, and I want them to all be eating healthy foods. So, I've grown to make just about everything from scratch, which certainly saves money! Great idea for a book! We're always looking for ways to stretch our income, especially with me at home! Oh, I so want to read this book. Five kids under five has made us very protective of our time. And it's made us think through everything we say yes to, every project we undertake. We look at it in the grand scheme of our family life and see how it will affect us. What a great resource--I hope to read it soon! As a wife, mother of three, and full time student I'm all about saving my energy and money! What a neat book. I saw it reviewed at Rocks in my Dryer also. I love when moms do books like this....it helps show we're more than "just moms". This looks like a great book with practical advice! I would love to get my hands on this book! Even with five (and a half) little ones, I still feel like there is so much to learn! Since having children, I have learned to be frugal and thrifty. I have begun coupon-shopping, we purchase nearly everything second-hand, I watch our utilities and I am always on the lookout for a way to make a little extra money. I don't see it as limiting to do these things, either, in fact, our family finds that it is a lot of fun to try to save money. Well, I don't have kids yet (They are top of my wish list though) so I don't know how they will save me money but I have a feeling it will be along the lines of "Necessity is the mother of invention." She points out something that I often forget. I will do things myself just to get the job done quicker instead of letting the children 'learn' to do the job. I am very guilty of this, then I wonder why I am so tired at the end of a day. Shame on me. We are doing a garden this year with the kids. My husband got an area ready for the kids to plant their goard plants. We will make some bird houses from the goards this fall. Number four is on the way, and I'm already feeling way behind in laundry and dishes... constantly. Having kids, though, has helped me learn to declutter. Less stuff=less mess. It's the only way I can stay ahead of them, beyond teaching them to clean up after themselves. Cool giveaway! As a family, we save money by having family nights. Instead of going out, we will watch a movie, play cards or a board game. The kids love it! Ooo, I'd love to have a copy of this book! I will admit upfront that my husband and I are just now pregnant with our first, but we look forward to many more! Just being married itself saves money! There's something almost magical about the effects of having to think about another person before you spend money. God is good! I would love to have the book, I am sure I could find lots of encouraging tips in it! My 2 1/2 year old son loves to help me with laundry, putting the dishes away, and other simple things, but I don't think I am willing to turn him loose with a vegetable peeler just yet!! Maybe I am over-protective?? I love her blog! I want to have a large family as well (no kids yet! ), and would be thrilled to win this book! Sounds like a fabulous book! We are about to add baby #6 to our brood! I think having a family has stretched my creativity and made me want to look for ways to be frugal. I think that is one of the fun parts of being a mom! What a wonderful giveaway!!!! I've learn with 3 pregnancy in less then 3 years that their is lots of ways to safe money! God as shown me how to stretch what we have to be able to give even more to others! Oh, please count me in. We don't have a large family yet, just four children so far, but one way they have bettered our budget is to keep us from spending too much on overpriced things. We seldom buy fancy new furniture or expensive dinners out because it seems silly to do that with children in the house who wouldn't appreciate them much. Instead we buy sturdy things, secondhand usually, that won't mind being a bit more battered. And usually they last far longer than their new counterparts would have. I only have 3 kids, but I'd love to see how she does it- I'm sure that I could learn a lot :). A large family is a challenge, in a good way, to constantly be creative and train your focus on what is really needed. In order to maintain our budget we are always looking for ways to simplify. Cooking from scratch, eliminating unecessary paper products, limiting erergy usage, not being too quick to buy anything...and the list goes on. It's amazing what we can do without if we just try! OOOh...OOOh...OOOh. This is a giveaway I would love to win. I have seen this book on OwlHaven and would LOVE to give it a thorough reading. I can't think of any way that my four children have saved me money... YET. They are all still small, but they sure do help with the workload around the house. I haven't made a salad in a LONG time, thanks to my cheerful helpers! This morning they vacuumed almost the entire house by themselves :) I am so blessed. While a large family is just a dream for now, I'm sure this book would give me a great start with our little guy arriving this summer. Please enter me! Looks like a great book. I have 5 boys and have really cut back on shopping. Not too easy when you bring the kids along...we have found so many "free" types of entertainment too! No cable...no time for TV, rarely eat out...and I truly don't miss it. Our biggest budget buster is socks and underwear! only 3 children so far but that book sounds wonderful. My husband and I save money by staying home. We live in a camper and travel the country so our home is on wheels. I do not leave my children with others( some say overprotective). We do dates after children go to bed. You save a lot of money watching TV on the computer instead of going out to the movies. And making all food from scratch. PS- My kids peel themselves every now and then, but they live through it and it teaches them caution for the future. Wow, sounds great! I'd love to win! I would love to read this. My husband and I are looking forward to having a large family. Having one child has already challenged us to look at our spending differently, so I know adding more will do the same. Plus, who doesn't want to know that toddlers can peel veggies? Count me in! I'm past raising children but I have several young friends who are mothers of large families! They would love the book! Sounds like a great book. I would be very happy if I were picked. I have 2 children and am pregnant with our 3rd. I would love a few more children plus some ideas on how people with large families make it work, happily for them. Thanks for your insight. This sounds like a great read! I would love to read a book (other than The Tightwad Gazette, of course) with REAL frugal advice!! My fingers are crossed!!! Thank you Meredith for providing a wonderful place for thrift! You make it so cool. I would love to read this book and then pass it along to a mom I know who has 10 children age 16 and under. I'm so glad you made an exception! I'd love to read this book. well lost my post, must remember to be signed in before i type.. I've been eying this book as we are also adopting from Ethiopia. I would love to read this! I think one of the biggest ways that becoming a mom has changed my money related thinking is when I tally up how much those "labor saving" items are really costing us, and compare that with how much labor it takes my husband to pay for them, and I frequently realize that it just isn't worth it to have him gone that much more and to cut back in other areas! Sure, it takes me more time to wash the cloth diapers, but we're saving money that adds up with every change. Yes, it takes more time to make pizza from scratch, but the price difference is astronomical. I guess before becoming a mom, I just didn't really realize how all the little things add up! We have saved by just plain ol' being home. The stuff that can be produced here through plain ol' creativity and inginuity saves dollars. I would enjoy reading this book. Before we had kids, my husband and I were pretty spontaneous about traveling, and would just do it when we felt like it. That added up. Now, the only time we travel is to go see family, and we wait for a deal before we buy tickets. I'd love to win this! My husband and I don't have children yet, and part of the reason is because of financial concerns. Anything that would set my mind a little more at ease would be wonderful! Thanks for the giveaway! I'm sure there are many great tips in this book and I look forward to reading it, but allowing a toddler to peel vegetables? That is not a chore I would start with. No doubt "peeling oneself" would indeed teach caution, but I would never take a chance on a baby actually hurting himself just so that he could learn to peel at age two. Having a family has helped us save money by forcing me to be less selfish. That sounds odd, I guess. But pre-family, I could buy what I wanted, do what I wanted, go where I wanted. Fun, but not so great on the pocketbook sometimes. Now that I have a husband and children (and their well-being both now and in the future) to consider in my choices, I find that I spend less frivolously and more frugally. Less selfishly and more "smartly." I have no children yet, but my mother is forever reminding my married sis and I that kids can do wayyyy more than people think. It's one of her favorite soapbox issues. She's around kids a lot and it boggles her mind at how little they're taught to do at a young age. She had us making our beds by age 3 (not well,I imagine, but that comes later), sorting laundry, helping with cooking, dusting, dishes, etc all at a very young age. We got sewing kits when we were 7 to learn basic sewing skills. I'm still not the accomplished seamstress that my mother is. She only made us learn basics, so at least I can sew on a button and hem things. 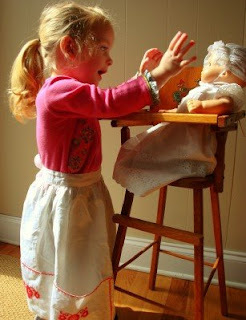 If I ever have children, I hope I remember this and put them to work at a young age! I was amazed at how many people did not know very basic things when I went to college, like laundry or how to cook extremely basic food. I'm entering. And I'll take the opportunity to say how much I enjoy your blog. I usually read through Bloglines, so I don't show up here very often. But I do appreciate what you write and ideas and inspiration I glean from your efforts. I'm entering! I don't have a big family yet (no kids) but plan to, and I'd love to know how it is done. We are getting started on our big family with three now. I would love to encouragement. Thanks for the give-away! Like some of the others, having a family has certainly put needs and wants into different categories...and my priorities are so different than they were before we had children! I know that STUFF really doesn't matter...family does! I am expecting baby #2 any day now so we are a long way from a large family, but with five frozen embryos (is that too personal?) we have the potential of a family with 7 kids...I think this book will be part of my research about whether this will be feasible for us. Oh, and being on bedrest for this pregnancy has been the best money saving move ever ;)! Ahhh, I need this book! Frugality hasn't been my strong point, but I'm working on it! I love to be in the mix for Mary's book! Thank you! I'd love to enter - I only have three kids but hope to have some more eventually and I could certainly use all the help I can get! I would love to read Mary's book! I look forward to reading your blog every day. You have given me new inspiration for my home living. This book looks great. Thanks for letting us know about it! I have a family of 8 and would love a copy of this book! Raising 7 children on one income here. Nothing new to your readers but unusual for our area. It's wonderful to read about how other people do it and a real encouragement. Thinking before making any purchase saves us money. There is so much that you can do without if you make up your mind. This sounds like a great book. Please add my name to your giveaway. Sounds like a wonderful book! I'm not sure that 3 kids constitutes a large family, but to me it sure feels like it will be. We definitely eat out less having kids. It used to be fun to go out, now it's more of a chore, so we stay home, or on the occasion that we do splurge it's usually some place less expensive. I would love that book! Having a family has helped me save money because it makes me more selfless. I just put this on my wishlist so I would love to read it! My concern for my family's health has really le to me being much more frugal - less junk! Thanks for recommendation and the chance to win the book. I would enjoy reading this book. Having a family has helped us save money by not eating out as much. It was too easy to eat out when it was just the two of us and we were both working. Now that I stay home it is easier to cook. It is usually much easier to eat at home then drag out a cranky, hungry toddler! This sounds like a great book. Something those with a small family can also use. Having a famiy has helped me save because I THINK before I buy. When it was just my husband & me I just bought & then thought. I think about what we really need: food, clothes, shelter, college, retirement (not wanting to be a burden on my daughter when we're old). I spend far less since I think first. I hope to have a large family someday! After having only one, I think we saved by altering our perspective. We buy far fewer things that we don't need, buy secondhand, and since I'm not leaving the house to work every day, I do far less shopping, which leads to less impulse buying. Having a large family has been a wonderful blessing to me. I have learned just how little we can get by on, and just how little we also need to not just survive, but to thrive! This sounds like a wonderful book, and will go onto my wish list for my birthday this month! I don't stop at fastfood NEARLY as much now as I used to!! Having a family (although not large) has helped me save money by helping me know what it truly important. I've only got two kids but we both grew up in large families and like the mentality. Thanks for offering! entering the giveaway, although I only have two going on three kids. Hehe! Having a family helps me feel more fulfilled. Looking for "things" to busy myself with is unnecessary, which is a good boost for a budget. I love both your blog and Owlhaven, btw. Have a great day! oh, man, I hope I win! I'd love to have a copy of that book! This book looks like a great read! Having a family has helped us save money because we hardly ever spend on ourselves anymore! Really, it helps you realize your priorities. That sounds like a great book, thank you for the chance to win! I think having a family has helped me ave money by becoming less wasteful, and far more resourceful when we're in a financial pinch! I'd love to win a copy of this book. I have only have 5 children (after the two foster children left) and we save money by being creative. Spending time together, thinking about the "value" of something (i.e. would I really enjoy this 7X more than that, justifying the 7X higher price? )and playing the coupon game; by far my favorite form of entertainment. I would love to win. I have 2 kids now, on my way to 5+, so I love reading about being frugal. We definitely need the tips now on our tight budget, and I expect even more in the future! Wow - looks like a great book. Thanks for offering it as a giveaway. Thanks again Meredith - you have a fantastic blog and are such an inspiration! We are a family of 7. This book looks great! Having a largish family has kept me creative. Finding cheap yet fun activities and cooking good food that still fits our budget. But I need MORE ideas! What I'm wondering, is what constitutes a "large" family these days? I have three young children and when we go out together I get looks from people and I KNOW they are thinking I have too many kids. I can't imagine what a mom of 10 kids goes through when she is out with the whole family! This sounds like a great book that I would enjoy and use. How I would love a copy of this book. sounds like a great book, would love to read it and learn more. With 3 kids and one on the way, I find that all the "fun" of shopping has been taken away. It's just not worth the effort to get everyone out the door and then have to keep them entertained while shopping. It saves us money, though. The book looks great! I really trust you and your opinion and I'm glad you told us about this wonderfully sounding book! I really enjoy reading your blog. I would love to read this book, I have 6 children & am always looking for new ideas, advice & etc. due in july with #4, this would be a timely read. One way having a family has saved me money is feeling responsible for their health even more so than my own. When single I didn't mind going out to eat 4-5 nights a week now I cook a lot from scratch for all of us at barely more than the same cost. Lots of saving in health, too! Love to win it, it looks great! I love Mary and would love a copy of her book. Having a family has really caused us to examine our spending in a new way. When we had two incomes, we spent frivolously, and we didn't budget well. I am thankful that we did invest some of my income, but now that we are supporting four on one income... I've found myself repenting of our foolish spending. Having a family has definitely caused us to be more thoughtful about our spending, more diligent in our saving, and more dependent on the Lord's provision. God is so GOOD to grow us through family! As a mom of a somewhat-big family (we're expecting number five), I'd love to read this book. Having a family has helped me save money by giving me more balance ... I no longer only have to think about my unexpected costs but have to plan ahead for those of my children. I try to balance spending money for fun with spending money on real life, and saving for what's important. I also save because I want to set an example of good stewardship for my children. I would love a copy of that book. The most obvious way having a family has helped me save money is making me cook instead of going out to eat. Enjoying the ambiance and trying new places and new foods were hobbies for me that were not compatible with the needs of a young family. My husband's reason for eating out was to enjoy the meat dinners that I did not feel competent at cooking. But I have learned! For those who are similarly inexperienced or squeamish here are my hints: dispoable plastic gloves (less $ than takeout and likely less carbon footprint than driving to eat out); recipes that minimize handling of the raw meat, such as roasted whole chicken, pork tenderloin, drumsticks in chicken cacciatore or adobo; to avoid grease spatter, use the broiler for burgers and steaks. Betty Crocker cookbook has good basic meat cooking techniques, less comprehensive but less overwhelming than Joy of Cooking et al. Sorry so long--love your blog and this is a fun addition Meredith. I've been reading your blog for about a month now. I can't remember where I popped over from, but I immediately put you in my favorites. Thanks so much for sharing your creative ideas. Oh, and the book sounds fabulous. Thanks Meredith....would love to enter this giveaway! One way we cut expenses in our family is by simply thinking and rethinking before making any purchases...even groceries! And most of the time, we come up with works as good and cheaper alternatives. Count me in! I'd love to read this book. i've been so excited to read this book and was glad to hear a review! thanks for doing a giveaway! I look forward to reading her book. It sounds great! I don't have kids yet. With our first one on the way, I'd love to read this book. Thanks for hosting the giveaway. Having children has helped me save money by teaching me a more macro way of looking at things, rather than micro. Seeing the big picture makes me less selfish and to plan for tomorrow rather than giving in to today's whims. only have one but i'm imagining there's still much i could glean from this! I've heard about this book and would LOVE to read it! Hi Meredith! I'm happy to be able to comment again here! :o) But I've kept up, nevertheless, reading your posts. Yours is one of the first I check each day. Please count me in for the book giveaway. I have only three children, but good advice from larger families is often applicable anyway. Thanks for offering this Meredith! I can't wait to read this book and see what other ways we can save money. Our frugalities include simple things like no cable TV, eating in as much as possible, buying clothes, etc. second hand. We also pack lunches instead of buying school lunches. And our "family nights" are times spent playing games, doing crafts, etc. We also save money by walking most places when the weather permits - especially nice since we live in a small town. Makes for a great way to get to know our neighbors! What a timely book - we are expecting our second baby in August, and hope to have a large family. Of course, money, is the first thing that everyone has an opinion about when they find out we would like to have a large family. I don't really have any great money saving tips other than to hang up laundry to dry - saves on electricity and makes clothes last MUCH longer!! Thanks again! This sounds like a great book! While my 3 children are grown, I have 5 granchildren, and I know we (parents and grandparents) could learn something from it. I found that when you have a large(ish) family, you can buy economy sizes, full freezers use less energy, full washing loads use less energy, all saving you money. In some ways I have found it to be costlier to cook just for my husband and me. A large family keeps you focused on your budget, too. Having a family has helped us save money because we realize every day that the Finer Things in life aren't Things at all! I am pg with number 5 and would to glean some wisdom from this lady!!!!!!! I’d love to be added to the drawing for the book. Thank you, Meredith. Having a family with a single income has helped us looking at summer vacation differently. We have been camping in national parks for the last 17 year. We started with bare minimum equipments the first year. Each year we have been adding one or two supplies toward the list. Now we camp very comfortably and frugally. The best part is that we all have wonderful memories from the trips and my older son would even carry that tradition into his own family. How has having a family helped save money? By focusing on what's important. We adopted a child with medical "special needs" (in addition to already having one who has multiple special needs and a "typical") on faith that God would provide, and He continues to do so. Without stretching ourselves to do such things, I know we'd still be living pretty selfishly - for ourselves. I rarely comment, but I love your blog! Great giveaway! I would love to win and read her book. Large families amaze me. I seem to have problems with just 1 child sometimes. I'd love to enter :) We have three kids. One is currently away at college, but he will be back home. scratch too!! I'd really like to read this :) Thanks so much for the giveaway, and a really great blog! Instead of wasting money on movies and meals we didn't really enjoy, since having kids we stay home and spend time strengthening our relationship. WOW! 160 comments?!? You are just too popular today! That book does sound wonderful though. Having a family has meant that I now stay at home, and thus have more time to do things that save money! I don't have a big family, yet. But it sounds like a great book. When we started a family we lost my income so I could be a SAHM. Learning to live on less out of neccessity has been the biggest catalyst. I also learned to see thrift as a choice I was making so that I am empowered to stay home with my kiddo. Since it's a choice, I can't feel sorry for myself about all the things I am giving up. I would love to win her book! It sounds very good. The biggest savings to having kids? No need to even consider paying someone to do the things you don't want to. I remind my teenager regularly that the reason I had him was so that I wouldn't have to take out the garbage, shovel snow, or mow the lawn. He's not amused. Another savings is that now that he's bigger, he and his dad can trade clothes back and forth. Would love to get my hands on this book. Please enter me in the giveaway-this looks like a really neat book! Thank you for letting us know about this book! I hope I win it, if not I hope to buy it someday! I've saved money by having a family by staying home. I previously worked as a school psychologist and now we are not only making it on just my husband's salary, but saving some each month! I'd love this! We "only" have four, but we're trying to live as frugally as possible and would love some advice from a mom who's living it. I love when I find books that combine frugality and raising a large family. There aren't many that I have found and I would LOVE to have this one!! I long to get wisdom from moms who are ahead of me on this journey! I would love to win this book! I am a very large family and could use some extra tips! It sounds like this book would be a practical read for all parents, not just those with large families! I have grown taller over these years and have learned from the best - Your blog has saved my 'sanity' and have gained ME points as a mom and wife in my keeping house, cooking from scratch and the day to day of wanting to keep my family of 4 intact... while journeying in the path of frugality and rebuking HSN.com. If you are a mom and wife - you ARE a special SUPER WOMAN! I am proud to be named amongst these! Working Mama in the Northwest! I appreciate your blog. Iwould really like to win her book. I'm always looking for furgal and creative ideas. I think every day I'm with my family, I grow a little older and wiser. Having children was really the greatest thing I've ever done with my life, and God has blessed us so richly. As I meet other mothers and families, we can learn from each other. I think just learning contentment is the number one thing you can do to save money. How about I buy 2 copies and I send you a check to reimburse you -so that 3 can be blessed with the book at your choosing! there are so many deserving mama's on here that YOU'VE blessed! working mama in the nw! This book looks great! Thanks for reviewing it. Sounds like a very insightful, helpful book; thank you for the chance to win it! A larger family has helped us get more creative with money, so we've been more careful and saved more than if we didn't need to think about it quite so much. Thanks for the opportunity to win! HI! Enter me in the contest and I love Mary's blog too! We have 7 kids so what I have to keep reminding myself is we are not like most families and our lifestyle has to accommodate OUR family and not what other's think it should be. Dinner time is high priority because it is such an event to get everyone fed. My kid's have learned that their lives will not be like all their friends that have both parents working and one brother or sister. They have to learn to share the wealth and the work!! I think the biggest lesson a big family learns and the parents have to teach just to manage is that you always think of others before yourself. Life could not work if everyone is constantly thinking of themselves around here. Not to say that we don't have moments! But I do think that lesson could benefit any size family out there. The way we save money with kids is, we don't have time or energy for expensive entertainment or hobbies; a trip to the library or coffeehouse, and all its blessed silence, is treat enough. I would love a copy of this book! I've been reading Mary's blog for quite a while now. What a great contest. As a mother of five with a newborn, I am struggling to find balance. I wish I had another mom with experience to lead me a bit. Sounds like a great book...I only have three kids (so far?) but I bet there is a lot I could learn! I would love to be entered as well. As far as money saving tips... slowly invest in quality kitchen appliances. For a large frugal family these tools will be your most used possessions. It doesn't make financial sense to keep investing in cheap(ly made) appliances. Thanks for making an exception Meredith! As a mom of one, i think I could learn a lot from a mom of 10!! Having my son has changed everything about my life and he is my inspiration for saving money so I can be a full time money. Through his arrival (and God's infinite goodness) I have learned how to get out of debt and save. I would love the book. Having children has helped me save money because it takes a lot for us to leave the house and if I don't leave the house I don't spend money! Does 4 kids count as a big family? Looks like a good book! I would love to read it. I found your blog when I was looking at the "mommy blogger awards" and I've enjoyed browsing through and finding some tips. I love bargains, and I'm trying to learn more all of the time. I would love to be entered in your giveaway. I think having a family helps me save money because I am more disciplined and want the best for my kids. I'd love to read the book! Awesome giveaway. I'd love to read this. How has having a family saved me money? That's an unusual question and one I've never pondered. :-)Having a family made me think more about priorities in every aspect of my life including the financial. As a result I saved money becasue Ispent money where it was most needed and not for my silly wants. (Although I (we) did/do indulge sometimes. Sounds like a great book! If I don't win I might just have to buy it. I think having a family helps me save money by making me more creative and able to be more selfless.